Not all loans go smoothly and you may default on your payments. In an attempt to recover their money a creditor may bring in the services of a debt collection agency. This agency will persuade you to repay any money owed, however the Office of Fair Trading (OFT) has specific fair debt collection guidelines to protect you from harassment. 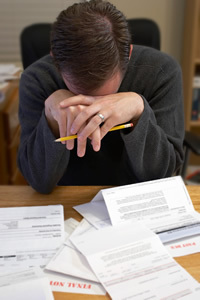 Read this article to learn more about what a debt collection agency can and can’t do. We also recommend that you seek debt advice as soon as possible. Debt collection agencies must work within the law and also within the fair debt collection guidelines published and enforced by the OFT. If you are falling into debt and your creditors have enlisted the help of a debt collection agency then it is important that you know how the OFT guidelines can protect you. It is vital that the debt collection agency does not misrepresent their authority, for example, falsely claiming to work under court instructions or assuming bailiff, sheriff officers or messenger-at-arms obligations. Also, falsely implying or stating that if you fail to pay your debt, you are committing a criminal offence or criminal proceedings will be pursued. They also cannot take or threaten you that they will take court action in the wrong jurisdiction area. Say, a Scottish debtor cannot be sued in an English court unless it was legally justified. Charging for the collection – the agency cannot claim you have to legally pay them fees when there is no contractual provision. Visits – the visiting agent must not act in a threatening manner. For example, he or she enters your property without your consent or not leaving your property when you have politely asked them to. Debt collection agencies must be licensed and come under OFT regulatory authority. The legal framework under which debt collectors work is the Consumer Credit Act 1974. All debt collectors must hold a valid and current Consumer Credit licence that covers debt collection activities. Agencies must comply with strict codes of conduct and its personnel must not have committed offences involving fraud, other dishonesties or violence. Debt collection agencies must also be registered, and comply with, the Data Protection Act which determines who companies hold and use personal data. Contravening this act can result in loss of the consumer credit licence and even imprisonment for the directors of the company for extreme infringements. Should an agency be found to be in breach of these regulations then the OFT can revoke the credit licences of those concerned. This means that the agency must then cease all debt collection activities which has serious implications for their business. Once a debt collection agency has been employed to recover money by one or more of your creditors, the situation has become serious. These agencies, whilst working under legal and regulatory constraints will be persistent and determined in recovering money for their clients. This is their sole purpose and they are very good at it. It is far better to take control of your financial situation at an early stage. As difficult as it may seem, admitting that your debts are starting to run out of control is an important first step. You should then seek debt help as soon as possible.